Weimar Porcelain from Germany dates back to 1790. The Weimar name evokes a great tradition of Bauhaus art and literature. 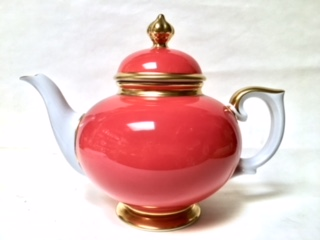 This striking deep orange red teapot is 7 1/2" in height and 9" from tip of spout to handle with gold trim and knob on lid.